Every Monday I will be including an interview with each Cursed Lands author. To start us off, this is my interview for Bloodlines; The Dark Fae Chronicles. Nova is taken to England by her mother, in what she thinks is a last bonding trip before she heads off to college. They visit Stonehenge and while there, Nova cuts her hand on a rock. She is overwhelmed by a vision of a being waking up, far beneath the ground. This leads to the Dark Fae being unleashed and Nova finding out the truth about who she is. It will be a mixture of urban fantasy and dystopian fiction. Think Bright, but the arrival of the Fae brings about an apocalypse. This will be the first book in a series. Nova is impulsive, but she able to adapt well to difficult situations. She learns about her Fae powers as the book progresses and as you can probably guess from the cover, her powers are fire based. This is a rare power to have in the Fae world. Nova is locked away while the apocalypse is in progress, so she does not know what is happening in the world. So she has to learn fast. I think the central theme is belonging. Nova is faced with a choice, to side with the humans, or the Fae. She believed that she was human her whole life, but the humans have treated her terribly, she was lied to by the woman she thought was her mother. So there is a lot of distrust. When Nova's mother takes her on a trip to England, she assumes it is a last minute bonding vacation before she goes off to college, but her mother is hiding something from her. When she abandons her, leaving her with her 'Uncle' Phillip, Nova discovers the truth. She is nothing more than a science experiment, kept like a lab rat for years, studied by a woman who isn't even her mother. Her bloodline is Fae. With the Dark Fae rising, only Nova can stop the Fae Queen from killing every human on the planet. She is the heir to the throne, but can she learn how to master her Fae powers in time to take down her aunt? Or will she perish with the humans? 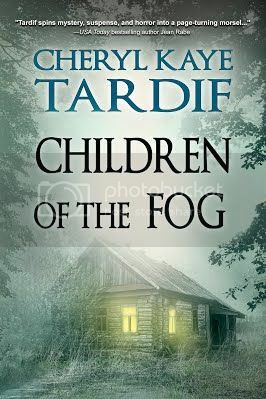 ***CHILDREN OF THE FOG has a unique tie-in to Tardif`s newest thriller, SUBMERGED. Sadie's woeful gaze drifted around the living room. Paper plates were piled everywhere. They had somehow gone astray and hadn't made it into the garbage can that she had so thoughtfully provided next to the dining room table. Plastic cups, some half full of pop, were on every table and counter space. There were more cups than there had been kids. "Ugh," Leah said behind her. Sadie followed her friend's gaze. A chocolate cake smear—so dark it almost looked like dried blood—stretched across the kitchen wall, three feet from the ground, a small handprint at the end. "Your house is a disaster," Leah said unnecessarily. Sadie sighed. "Well, at least it's quiet." Sam had gone upstairs to his room, tired from all the excitement and junk food. The last time she had seen him, he was lying on his bed. "He's probably asleep," Leah said, reading her thoughts. Sadie gulped down her ice tea, then set to work on the kitchen, while Leah looked after the living room. After an hour had passed, all that was left to do was run the vacuum over the carpets and turn on the dishwasher. "All done," Leah said, wiping a bead of sweat from her brow. "Thanks. I can handle what's left." "You're being silly," she muttered. Sadie closed the door and slid the deadbolt into place. Then she locked up the rest of the house, set the alarm for the night and went upstairs to check on Sam. When she opened the door to his room, she smiled. Sam was stretched out across his bed. On top of the blankets. A soft snore issued from his half-opened mouth. He had passed out from exhaustion, his face covered with chocolate cake, white, black and blue icing, and an orange pop mustache. "Happy birthday, little man," she whispered, tucking an extra blanket around him. She closed the door and headed downstairs to wait for Philip. Sadie was abruptly roused from a deep sleep. She jerked to a sitting position, inhaling deeply, and looked at the space beside her. It was unoccupied, the blanket still tucked under the pillow. She had waited for Philip downstairs for hours. Eventually, she had given up and gone to bed. She peered at the bedroom clock. It was half past midnight. She'd only been asleep for about forty-five minutes. In the murky shadows of the room, she felt a foreign presence, a movement of air that was so subtle it could have been her own breath. She squinted at the window. It was closed. Somewhere in the house a floorboard creaked. Tossing the blankets aside, she slid from the bed and walked to the door. Remembering the brick thrown through Sam's window, she froze. Her stomach fluttered as she imagined a gang of teen hoodlums breaking into the house. But the alarm would go off, silly. Still, she pressed an ear to the door and strained to listen. At first, there was silence. Then another creak. She was about to open the door when she heard an unfamiliar ticking sound. Had Philip bought a clock for the hall? Whatever it was, it was coming closer. Her heart began to pound a maniacal rhythm and her breath quickened. When a shadow passed underneath the door, she held her breath. Her heart thumped almost painfully in her chest. Then the shadow was gone. Cautiously, she opened the door. Just a crack. With a tremulous laugh, she flung open the door, a show of false bravado. Maybe Philip was working in his office. Maybe he'd gone to check on Sam. She walked down the hall and stopped in front of Sam's room. Her toes tingled as a draft teased her feet. She shivered, then opened the door. The window that Philip had replaced gaped open—black and hungry—like a mouth waiting to be fed. The curtains flapped in the night wind, two tongues lashing out. She frowned. Philip hadn't left the window open. He'd gone to work early, without a word to either of them. And Sam couldn't have opened it. He wasn't tall enough. Did I leave it open? She crossed the room, barely looking at the mound in the bed. She reached for the window and tugged it shut. The lock clicked into place, the sharp sound shattering the stillness. Then she glanced at the bed. Sam hadn't even stirred. But then again, he never did. He was almost comatose when he slept and nothing could wake him early, short of a sonic boom. She tiptoed to the bed and touched his hair. Then, closing her eyes, she leaned down, kissed his warm forehead and breathed in his sweet child scent. He smelled of chocolate and sunshine. "Snug as a bug," she whispered. She stepped back, her foot connecting with something soft and furry. Reaching down, she fumbled in the dark until she found the stuffed toy dog that Philip had given Sam the night before. She moved quietly toward the closet, inched the door open and tossed the toy inside. Then she stepped out into the hall, shutting the bedroom door behind her. Her gaze flitted to the far end of the hallway, where shadows danced between silk trees that stood in the alcove. Beside the trees—two-thirds up the wall—was a small oval window, and through it, a full moon was visible. It hung in the cloudless sky, a pearlescent pendant on invisible string. It was a beautiful night, one that was meant to be shared. Loneliness filled her, but she shrugged it off and plodded down to the kitchen to get a glass of juice. Five minutes later, she went back upstairs, with every intention of crawling into bed and ignoring the fact that Philip hadn't even bothered to call on the night of their son's birthday party. As she passed Sam's door, a flicker of light beneath it caught her eye. Then she heard a soft thud. Sam must have fallen out of bed again. He had done that on two other occasions. Usually he woke up screaming. She opened the door and sucked in a breath as her gaze was captured by something that made no sense at all. The window was open again. Moonlight streamed through the window, illuminating the bed. It was empty. She reached for the light switch. At the sound of a stranger's hoarse whisper in her son's bedroom, she did the most natural thing. She flicked on the light. 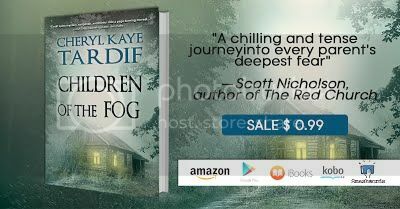 Cheryl Kaye Tardif is an award-winning, international bestselling Canadian suspense author published by various publishers. Some of her most popular novels have been translated into foreign languages. She is best known for CHILDREN OF THE FOG (over 200,000 copies sold worldwide) and WHALE SONG. Residing in West Kelowna, BC, Canada, Cheryl is now working on her next thriller. ​Alien Blood is a roller coaster of an adventure that looks behind today's headlines to discover the truth behind several so-called conspiracy theories. America's secret pact with the Grays and the Draconians to permit human abductions in return for technology is in danger now that both alien races fear the return of a far more ancient race. Ben and Heather grew up believing their mother to be mad, as she claimed to be an alien abductee. Now adults, they discover the truth. She wasn't mad and aliens are very real. A rollercoaster ride full of intrigue, secrets and an answer to that fundamental question - are we alone in the universe. Highly recommended.